I used 3 slats of barn wood from Hobby Lobby (about 3″x 16″ pieces) – pretty much any wood will do. Just make sure it’s at least 1/2″ thick. Then I put 2 pieces of wood in the back and used some of my wire nails to join them all together. Once I had my word template ready, I laid it on top of the board and taped it with a couple pieces of clear tape to hold it in place. Once my template was in place, I started hammering in nails all around the penciled outline. The key part to remember is that the closer together your nails are, the smoother your curves will be. Also, the nails should all be hammered in as close to the same depth as possible. Mine look like they are standing about 1/2″ above the surface. Tada – finished outline. Next I carefully tore the paper away from the nails. Gentle tugging does the job. If there’s a tiny piece of paper left that your fingers can’t pull out, use a pair of tweezers. Next I got my string and tied one end to a starting point. A lot of this involves just making it “look right.” If something looks un-right, just go back and do it again a little differently until it’s exactly the way you want it. I know. This is a terrible explanation but I promise you’ll understand and get the feel once you start. Now all that was left to do was to finish off the loose thread ends. I just took a paintbrush and a little bit of Elmer’s glue and brushed the ends up against the other string. I made one for my sister, and it looks so pretty the way she styled it in her home! If you enjoyed this tutorial, you might also be interested in looking at the following projects! Love family name signs? Try this budget-friendly, NON-expensive letter idea! Hi! 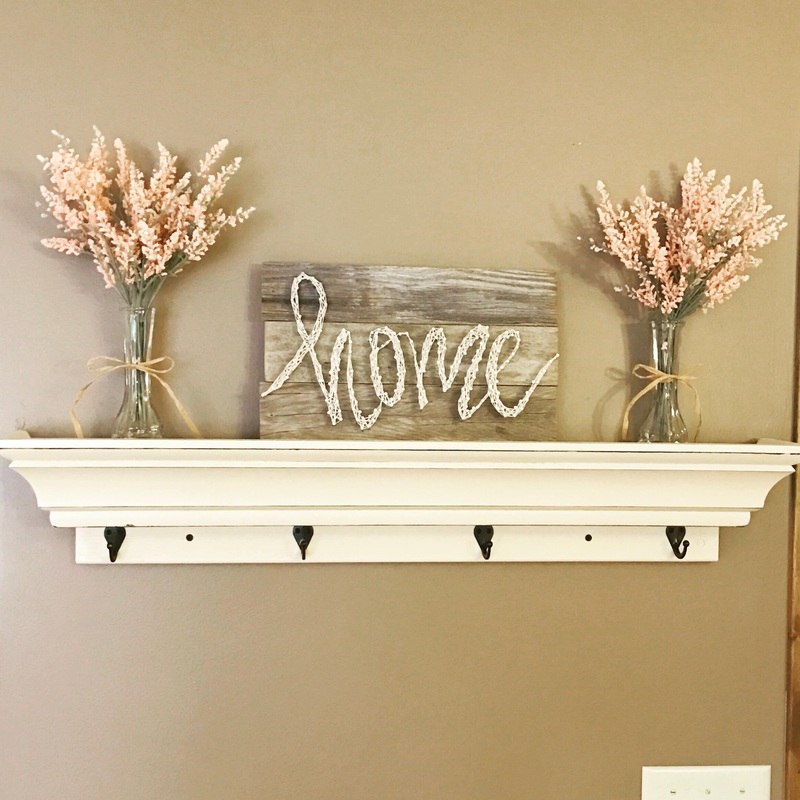 I’m an editor for Remodelaholic.com and am writing to request permission to use a photo from your Home String Art post. We hope to feature this in an upcoming round up about styling farmhouse entryways. We would include a backlink and clear credit to you via the name of your blog.